In an oval 5- to 6-quart slow cooker, stir together 3 cereals, pretzels, cheese crackers, bacon bits and Parmesan cheese. In small bowl, beat melted butter, oil and ranch dressing mix with whisk until well combined. Pour over cereal mixture; stir until evenly coated. Spread cereal mixture on ungreased cookie sheet or sheet of waxed paper. Cool 3 to 5 minutes before serving. Want to add a punch of protein to this snack? Have fun mixing in a cup of your favorite nut mix! 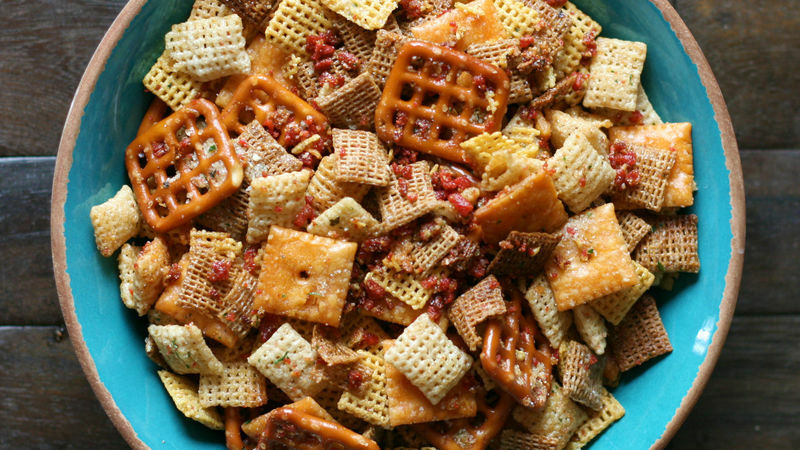 This Slow Cooker Cheesy Bacon Chex® Mix is a great crunchy snack to add to packed lunches.